Dr. Miller is an Assistant Professor of Diagnostic Radiology, Dr. Mirvis is a Professor of Diagnostic Radiology and the Director of Trauma Radiology, Ms. Harris is the Chief of Radiologic Technology, Department of Radiology, and Dr. Haan is an Assistant Professor of Surgery in the Division of Surgical Critical Care and the Shock Trauma Center, University of Maryland Medical Center, Baltimore, MD. Dr. Mirvis is also the Editor-in-Chief of this journal. 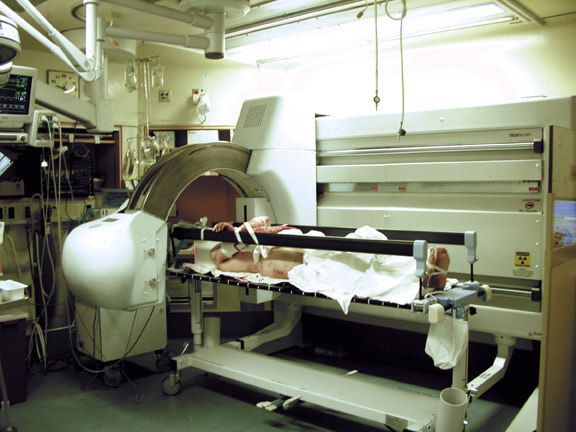 In 2003, the University of Maryland Shock Trauma Center acquired the first digital total-body radiographic scanning system in the Northern hemisphere. The concept of this device was originally developed in South Africa for detecting theft by diamond-miners and, more importantly, allowed the effective elimination of the "extortion influence" on these individuals from local organized crime. Because of the need to frequently screen miners, as well as the number of miners who needed to be surveyed, the system required both low radiation exposure to meet international standards and speed to screen a large population efficiently. The machine was originally configured like a phone booth, with the source and detection system moving vertically over the worker. Ultimately, it was recognized that this concept could be applied in medical imaging as a method to screen patients sustaining polytrauma quickly and at a low radiation exposure. The system was modified into a C-arm configuration to scan supine patients through a 90˚ arc. The machine was placed into clinical service in two South African Level 1 trauma centers for initial clinical evaluation (the Groote Schuur Hospital, University of Cape Town and the Milpark Hospital, Johannesburg). The first clinical studies indicated that the total-body digital radiograph could save time to diagnosis and provided acceptable image quality compared with conventional radiology systems. 1 The system was delivered to the Maryland Shock Trauma Center in June 2003 for the purpose of expanded clinical assessment, technologic/clinical use feedback, and suggestions for product refinement to the manufacturer (Lodox Systems, North America, South Lyon, MI). During the first months of use, it became apparent that the system required somewhat more power to adequately expose patients with a larger body habitus, particularly in the lateral projection of the cervicothoracic spine. In addition, the user interface required further development to maximize scanning efficiency. These initial limitations were corrected through an increase in generator power and tube output. Also, the software interface was completely revised to provide a major improvement in operating simplicity and to improve image processing algorithms significantly. In addition, a stretcher was developed specifically as part of the system, which is now named "Statscan" (Figure 1). The new stretcher can be used as a patient transport stretcher from a helipad to permit patients to be taken directly to the scanner as permitted by their clinical condition. 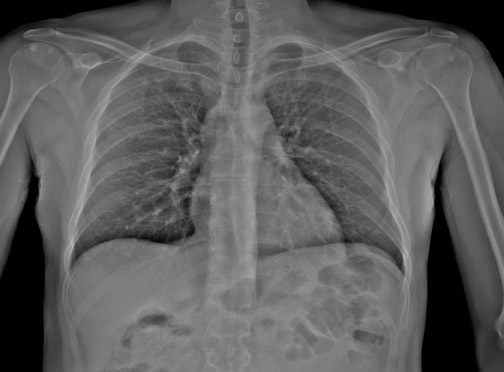 5.0 lp/mm for a given clinical condition offers significant advantages over fixed field-of-view (FOV) digital radiography (DR)-based technologies and is reminiscent of the clinical flexibility previously available to radiologists only by using conventional analog film techniques (ie, going from screen film to nonscreen film) as needed for greater radiog- raphic detail. Two rotating anode "computed tomography (CT)-type" X-ray tubes are available at 2 and 3 million HU with generators providing 64 to 80 kW peak output. The X-ray source provides an adjustable narrow fan-beam with either 0.4- or 1-mm collimation. The 1-mm collimation is typically used for large patients in the lateral projection. The system is interfaced to a dedicated workstation that provides 1600 × 1200 pixel resolution with 16,000 gray levels and/or to a picture archiving and communication system (PACS) network via DICOM standard. The dedicated workstation provides automatic image optimization (known as Lucid enhancement), which includes edge enhancement and histogram equalization, window and level adjust, as well as variable zoom, pan, rotate, and gray-scale inversion. The system is interfaced to our radiology information system to obtain patient demographics and clinical information via a DICOM worklist-compatible interface. The entire database of images is retained in the system hard drive (36 GB disc) as a large-capacity temporary archive or can be permanently archived to DVD or transferred to the PACS. Images obtained from Stat-scan can also be loaded from the workstation to CD or printed directly to film. The patient imaging table/trolley has a weight capacity of 450 pounds and adjusts from 0 to 340 mm in height with 10˚ ± Trendelenburg. The patient safety rails are carbon fiber, and therefore radio-lucent, and can be left in place during radiography when needed with minimal artifacts or can be lowered and raised easily. The patient imaging table/trolley also has a mount for an oxygen tank and intravenous pole. These features allow this patient imaging table/trolley to double as a trauma-ready gurney for transporting patients from the helipad. 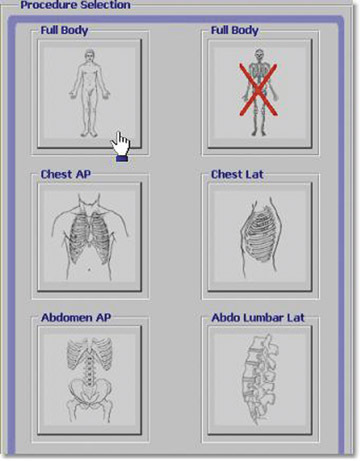 The technologist user interface (Figure 4) has been easy to learn and operate for our radiographers. Preset protocols are provided that allow for rapid setup. In our practice, we believe that two radiographers provide optimal efficiency by allowing one to position the patient and the other to set up and initiate image acquisition. Generally, we perform a total-body anteroposterior view, a lateral spine view (Figures 5 and 6), and a spine oblique projection (Figure 7). The spine oblique view can be accomplished easily because of the C-arm configuration, and it has proved to be very beneficial clinically to clear the cross-table lateral (CTL) spine. 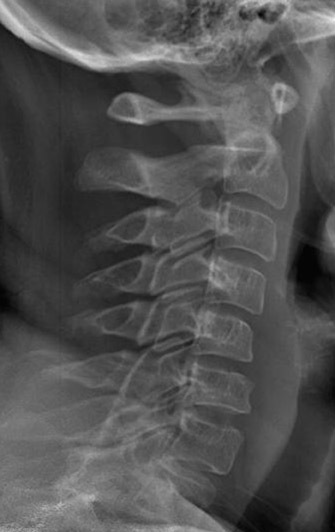 On occasion, a quarter-speed image of the cervicothoracic spine junction may be needed. 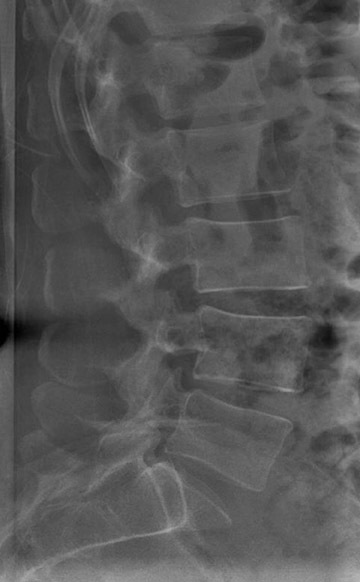 Selected high-resolution images can be performed subsequently as indicated to provide detailed views of pathologic findings (Figures 8 and 9). 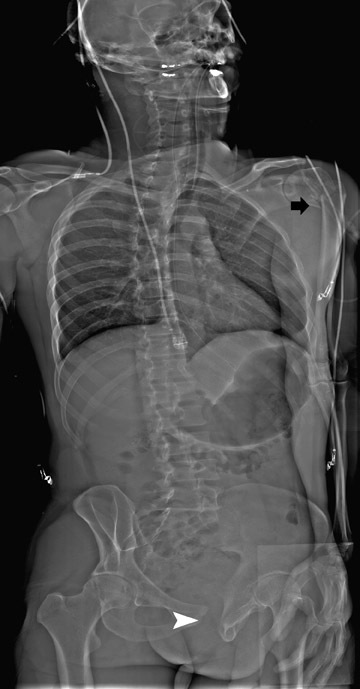 Because of the experience of our technical staff in the utilization of Statscan to date, multiple views (2 to 3 on average) of virtually every body part can be obtained in <5 minutes total in most cases, making this technology the most comprehensive and efficient radiographic tool that that we have ever used in the Trauma Resuscitation Unit. A very important aspect of Statscan is a significant decrease in radiation exposure for the high-quality images obtained (Table 2). Radiation exposure is typically <25% of the dose for a conventional radiograph of the same body part, but this varies by body part (Table 2). A key issue concerning the use of the Statscan is integration of this resource into the typical patient flow through an emergency-trauma center. A further consideration is how a total-body radiographic survey is best combined with multidetector CT (MDCT) in this environment. In our practice, it is apparent that CT is evolving into a major resource for diagnostic imaging of the polytrauma patient. The capacity of MDCT to image the brain, spine, and details of thoracic and abdominal pathology is well-established to the extent that some question the need for any radiographic assessment of trauma patients. In our state-of-the art practice, it was still traditional to obtain 3 to 5 radiographs for most polytrauma patients prior to Statscan, especially those whose conditions permitted only a limited physical examination. Now we are doing one or the other, depending on the clinical scenario. Even with a technician aide, the traditional computed radiography (CR) process requires 25 to 45 minutes before images are available (personal communication, Lois Harris, Chief Technologist, June 2004). After processing, some images must be repeated, which adds extra time to the overall process. This is a rather long time to wait for critical diagnostic information for a high-risk trauma patient. Further, even with two MDCT scanners available at our center, many patients are triaged for delayed CT scanning, not infrequently beyond 2 hours, depending on patient admission rate. As is true of many polytrauma admissions, our patients are often unconscious or obtunded and are not able to provide any information concerning symptoms. In this environment, the capacity to acquire a full-body survey in <5 minutes, including patient preparation, is a marked advantage over our traditional procedures. 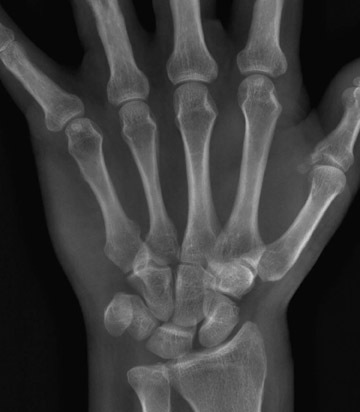 Acute pathology that is identified on the digital radiograph can be acted on immediately if needed (Figure 10). Also, findings can be used to tailor the CT study to include certain regions, such as the hip or shoulder, that normally do not receive dedicated CT imaging in our routine total-body protocol. Injuries to the extremities are detected on the Statscan survey that may not be apparent clinically or by the routine polytrauma MDCT assessment. 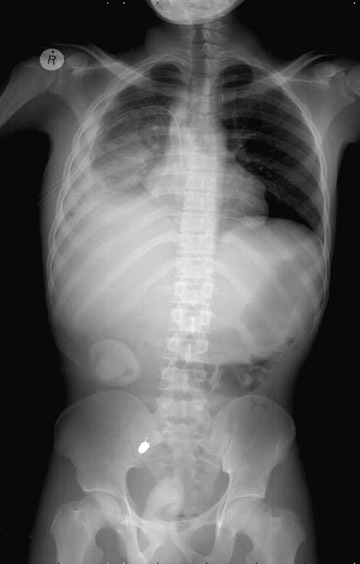 The course of ballistic objects is easier to determine quickly from the total-body digital radiograph. Currently in our practice, the Statscan is obtained after the patient has undergone a primary survey in a clinical-care cubicle and stable vital signs have been assured. In contrast, at Milpark Hospital (Johannesburg, South Africa), patients are screened immediately on arrival from the field and undergo Statscan before admission to the resuscitation unit if they are judged clinically stable. Alternatively, the very low primary and scatter radiation of the Statscan system allows the initial physical survey to be done on the Statscan gurney with only a brief interruption for the Statscan image to be acquired. The staff can remain only a short distance (4 feet) from the patient and there is no need for a shielded room. 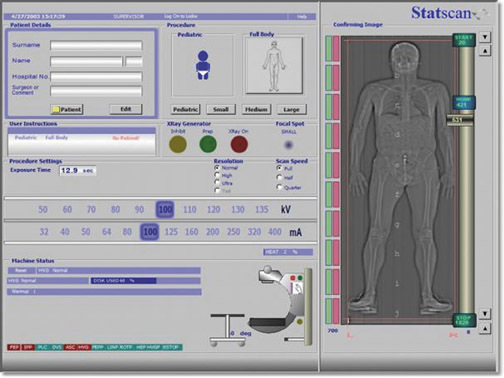 The Statscan monitor can be placed next to the patient for immediate review of the image. 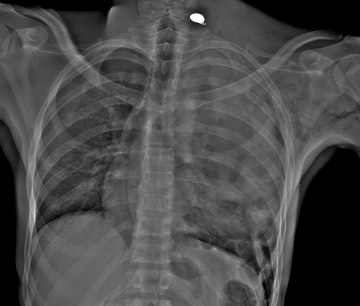 Confirmation of emergent central line placement, endotracheal intubation, and chest tube position can also be checked immediately, as well as results of procedures such as lung re-expansion or hemothorax evacuation. 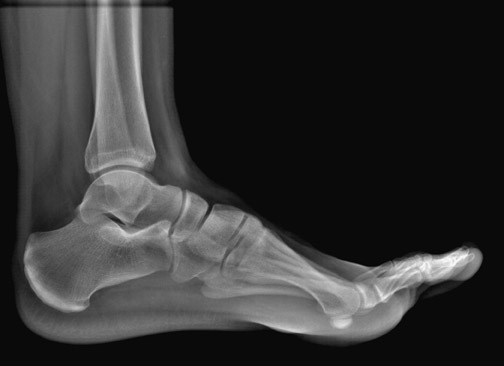 In our practice, some CR studies are performed after the Statscan or MDCT generally in the post-"Golden Hour" trauma assessment time period to obtain specialized radiog-raphic views, particularly for orthopedic injuries. While in most cases such images could be obtained on Statscan, we have chosen to take a more traditional course because of our high-volume trauma pa-tient assessment requirements. Based on our experiences, we are confident that the long-term use of Statscan will confirm its many observed clinical benefits and that it will play a major role in imaging in the acute trauma setting. However, this feedback is currently based only on our nonscientific interpretations to date. We will need significantly more time to compile and complete a full prospective study to establish that Statscan's image quality is comparable to, or better than, traditional methodologies; that the observed time savings actually confirm that a significant amount of time is saved from admission to diagnostic results; and that more injuries are detected (especially orthopedic injuries) that require emergent or urgent care than are diagnosed by our routine approach. Further, the added value that screening total-body radiography contributes to MDCT must be measured systematically. Prospective studies designed to answer these questions are in progress at three currently installed U.S. Statscan sites. Spatial resolution does not depend on speed--speed is used only to achieve more X-ray flux for higher penetration. The resolution is determined by the "binning," as shown below. "Binning" essentially means creating different size pixels out of a matrix of grouped pixels (placed into a geometric "bin"). 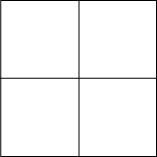 This is a visual of a larger pixel created from 4 smaller pixels in a 2 × 2 bin. A single pixel is 0.06 mm. The newly created pixel is now 0.12 mm. Binning directly affects resolution mainly for this reason. 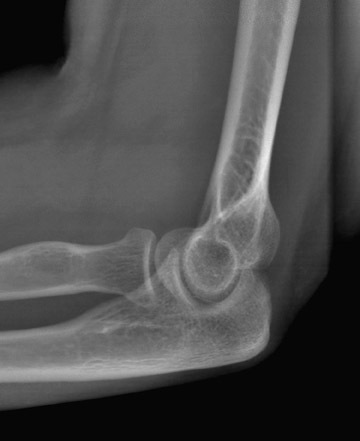 Total-body digital radiography for trauma screening: Initial experience. Appl Radiol.